Kayaking is one of the most challenging water sports that one could go for; it requires strength, swiftness, and a whole lot of promptitude. Here, of course I’m talking about professional kayaking where you’d see someone riding a crazy wild river as if they’re risking everything to be there. However, nowadays, kayaking has a recreational side to it with all the different inflatable kayaks on the market. The Intex is one of the brands that have established a strong base of inflatable water products that meets the different needs and desires of each one of us. On this review, you’ll be acquainted with two of their most practical, most packable, and most functional inflatable kayaks; the Challenger K1 & K2. 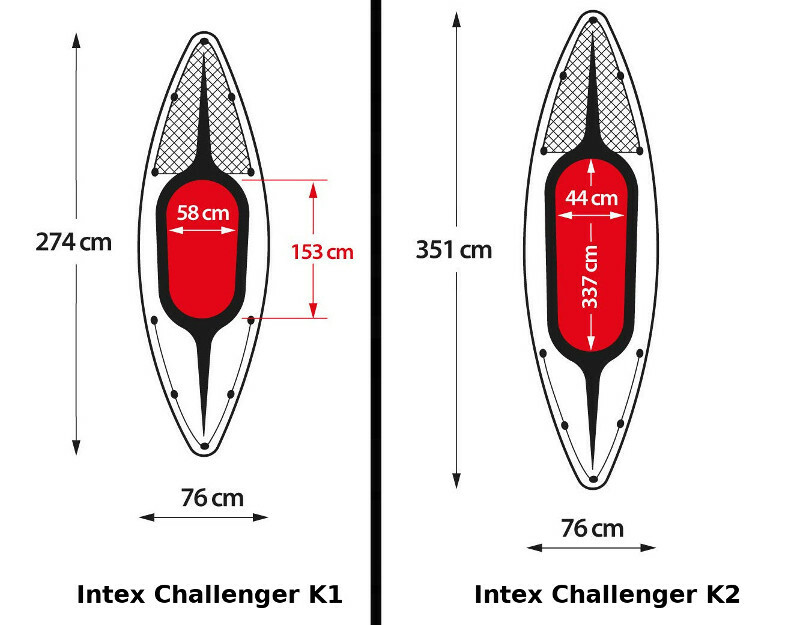 First things first though; the Challenger K1 in a 1-person kayak with the following dimensions once fully inflated: 108″ x 30″ x 15″. The Challenger K2 is a 2-person kayak that measures 138″ x 30″ x 15″. Both these kayaks are built with a nicely made cockpit which makes it really easy to access and leave the kayak; it’s made in a way to maximize the rider’s space and comfort. You’ll get to sit very comfortably with your legs fully stretched thanks to the great space on the front. However; whomever using the second seat on the Challenger K2 won’t get that luxury. Additionally, the I-Beam support adds to the already natural buoyancy of inflatable kayak which gives enough support for you to sit however you like, as well as the ability to stand up when needed without the risk of taking a swim. That being stated, the Challengers are made of military Super Tough vinyl material which is puncture- and UV damage-resistant for long term durability. Once fully inflated, the Challengers will turn rigid and stiff enough for a great ride thanks to its rugged construction. The Challengers are really well built given their prices; they gave quite a performance even though they are not expected to do much taking into consideration the fact that they’re made for recreational kayaking. Intex thought it out really well and came up with extremely affordable kayaks that get all the boxes ticked. The first thing to notice is the well-made inflatable seats which are really comfortable. You get to attach them using the Velcro patterns; they’ll allow you to sit back comfortably and they actually provide quite a support thanks to the featured strap that keeps the backrest rigid and tied to the kayak (of course, the Challenger K1 is featured with one seat while the K2 has 2 seats). Aslo, you’ll find the previously mentioned cockpit that is really comfortable; you can actually sit in different positions and comfortably stretch your legs without affecting how you paddle or the kayak’s performance. The Challengers are also featured with a great storage area that will allow you to secure any cargo or equipment using the cord net on the front as you can see in the pictures. It comes pretty handy especially that you can reach to it easily even when you are in the water. You’ll find a grab line at each end of the kayaks to facilitate carrying them around once fully inflated. Last but not least, both the Challengers are featured with a slide-in box to attach the skeg; it’s rigid and it’s very simple to use. Looking at the Challengers K1 and K2, you probably wouldn’t need me to tell you that they’re not made for racing, great adventures or wild kayaking. With their low profile, these kayaks are perfect for lakes and slow moving rivers. The flat hull given to both the Challengers provides enough balance and stability to keep them under control in flat water; it’s the most recommended hull when it comes to recreational kayaking. The previously mentioned I-Beam also contributes to the kayaks’ balance allowing you access or leave the cockpit easily even when you’re standing tall. Trying the Challenger K1 in choppy water actually was so much fun; I didn’t feel, not even for once, that the kayak might flip around or take a swim. The kayak was following the waves and staying on top of them as if it’s meant to be there. However, a bigger kayak that meant for white waters or so would definitely do so much better. Both the Challengers are featured with a removable skeg which is known to enhance any kayak’s performance as a whole. You’ll be able to sense the difference once you start kayaking with the skeg attached; you’ll get better balance and tracking. The Challenger k1 or K2 could be fit for anyone including kids, teens, and adults; they’re extremely easy to pack, pump and deflate with a weigh capacity that goes up to 220 lbs for the K1 and 400 lbs for the K2. Add to that the brightly colored graphics that make it almost impossible to not be seen by other boaters. The Challenger K1 or K2 of course. The Challenger K1 comes with a 5-piece aluminum paddle that goes up to 86 inches while the K2 is featured with 2 of them. Both come with a strong bag shaped a bit like a large briefcase. A high output hand operated air pump. A net cord to secure extra cargo on the front of the kayak. The Challengers are great recreation kayaks. They’re puncture- and UV damage-resistant. They come with their own paddles. They’re very easy to pack and unpack. They’re featured with comfortable seats. They’re built with maximized space for both the cockpit and cargo. They come with skegs for better tracking. The Challengers are not quite the performers in white waters or the open ocean. The paddles are not the best quality out there.